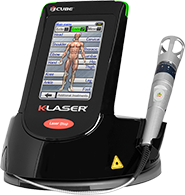 The K-Laser offers Advanced pain relief for acute and chronic conditions without the use of drugs or surgery. The K-laser is FDA cleared and produces a fast complete recovery by increasing blood supply, increasing nerve function, developing collagen and muscle tissue, decreasing inflammation, and eliminating pain! 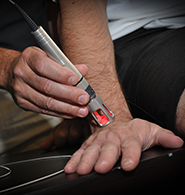 Laser therapy (photobiomodulation) entails using low-level laser light to relieve pain or heal wounds. 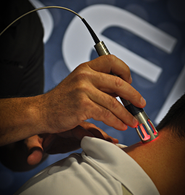 Laser therapy is commonly used by individuals with chronic pain, athletes, and others. The number of sessions depends on the exact diagnosis, age and overall health of the patient, among other factors. In general, acute conditions can be treated more frequently and require fewer visits, typically 6-10. Chronic conditions may require more visits, and do not need K-Laser treatment as frequently. The effects of K-Laser treatments are cumulative. Patients may experience significant pain relief very quickly. It is important to follow through with care in order to benefit from the biostimulative properties of therapeutic laser light. K-Laser treatments are extremely safe when applied by a K-Laser certified, properly trained professional. K-Laser treatment is safe to deliver directly over metal implants, over broken skin, and on acute injuries.